The Indian river tern or just river tern (Sterna aurantia) is a bird in the tern family . It is a resident breeder along inland rivers from Iran east into the Indian Subcontinent and further to Myanmar to Thailand, where it is uncommon. Unlike most Sterna terns, it is almost exclusively found on freshwater, rarely venturing even to tidal creeks. This is a medium-sized tern, 38–43 cm long with dark grey upperparts, white underparts, a forked tail with long flexible streamers, and long pointed wings. The bill is yellow and the legs red. It has a black cap in breeding plumage. In the winter the cap is greyish white, flecked and streaked with black, there is a dark mask through the eye, and the tip of the bill becomes dusky. 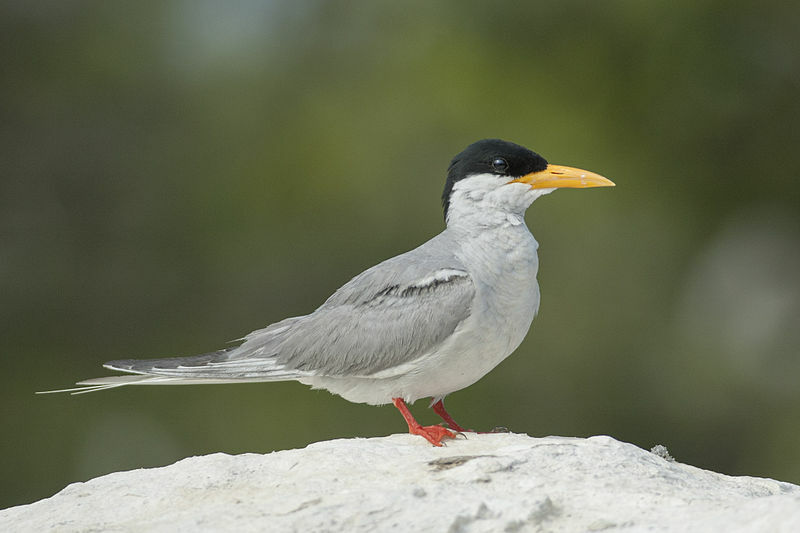 As with other Sterna terns, the river tern feeds by plunge-diving for fish, crustaceans, tadpoles and aquatic insects in rivers, lakes, and tanks. Its numbers are decreasing due to the pollution of their habitat.